By CE Pro Editors · February 15, 2018 • The KD-Pro8x8D Matrix Switcher de-embeds audio from supported or non-supported ARC displays via HDMI and TOSLINK external audio connections. 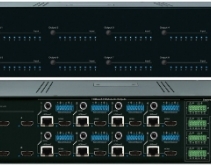 By CE Pro Editors · December 29, 2017 • Key Digital's KD-CX800 gives reliability to third-party control systems and network based apps. By Robert Archer · February 14, 2017 • Key Digital's KD-IP120Tx HDMI over IP transmitter can send 1080p at 60Hz signals up to 400 feet. Dealers can employ as many as 1,024 transmitters in a system. By Robert Archer · December 15, 2016 • Key Digital's KD-Pro6x6CC matrix switcher supports Ultra HD 4K content, as well as HD and the HDCP 2.2 protocol, to comply with the latest copyright protection standards. By Fred Harding and Brent McCall · March 4, 2016 • Two industry technical sales pros outline key considerations for 4K Ultra HD, including HDBaseT, HDMI 2.0, HDCP 2.2, high dynamic range (HDR) and some problem-solving tips and tools. 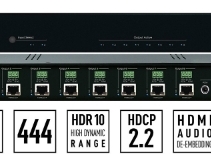 By Robert Archer · March 1, 2016 • Key Digital's KD-HD1x4ProK supports integration into control systems from Compass Control, Crestron, AMX, Control4, Extron, URC, RTI, Savant and others. By Robert Archer · September 30, 2015 • Key Digital adds to its Fat Cat Series of signal transmission products with several new product announcements. By Robert Archer · May 12, 2015 • SoundTouch Developers API enables control and automation companies to incorporate SoundTouch line into systems for homeowners to play back and manage their music collections. By Julie Jacobson · April 30, 2015 • Don’t call it a ‘converter,’ but Key Digital’s new KD-HDFIX22 HDMI extender will allow HDCP 2.2-protected content to play through legacy HDMI devices. By Robert Archer · April 30, 2015 • Key Digital has added new products that offer HDMI switching capabilities as well as the ability to de-embed audio from HDMI signals to enable dealers to route that audio to external digital or audio outputs.